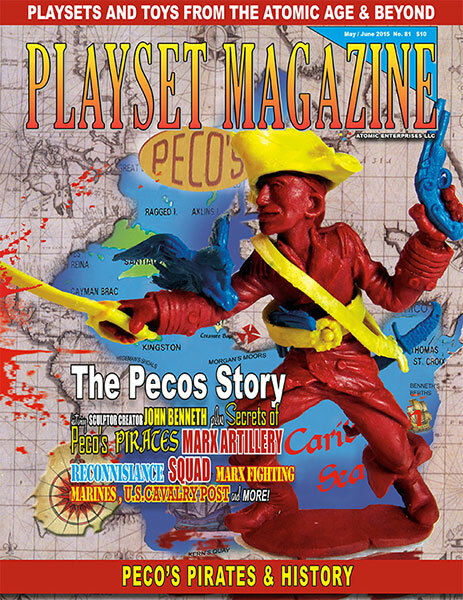 PLAYSET MAGAZINE ISSUE 81: The Pecos Story! WELCOME FRIENDS to a springtime fabulous issue filled with surprise after surprise! Such a long winter just begs for a sunny morning at the flea market for the search, and you’ll read about some great finds this issue. PM 29 The Untouchables & 30 Ben-Hur are both joining the premium section with about 75 copies left. Only 5 copies were found of PM27 The Charge of the Light Brigade issue, far less than expected, sending it immediately to the premium section If you are lacking these, you may wish to consider this the time to order. We'll honor the old price until the new issues (with the new premium back issue section in print) arrives. A carton of PM14 Fort Apache Part II has been found, adding to its dwindling supply, but it will stay with the others for now and there’s only 4 left of Issue 16, Fort Apache Part III. THIS ISSUE On our cover is Captain Kidd, heralding our feature story, set against a map of the Caribbean and some tiny coves and cays of the Pirating area. It’s another first -- the only time the entire line of Peco’s famous figures hasever been shown in mint condition and packaging. These are rather obscure, but their tale is awesome, a real David and Goliath as a small line of figures comes up with a brilliant idea: "Interchangeable Accessories" and goes up against the big guys. You can see the effort in the Army, Western, Pirating and other lines. But it is the sheer genius of a smart Irish factory man named Ralph McGilvra, and the fellow who would become the "Father of Interchangeable Accessories", predating them all, John Benneth, without whom a whole range of toys would not have been made. Pecos has never been fully covered before because they are so hard to acquire -- but now, thanks to the incredible collection and efforts of Mark Hegeman, you'll see for yourself just what you've been missing. 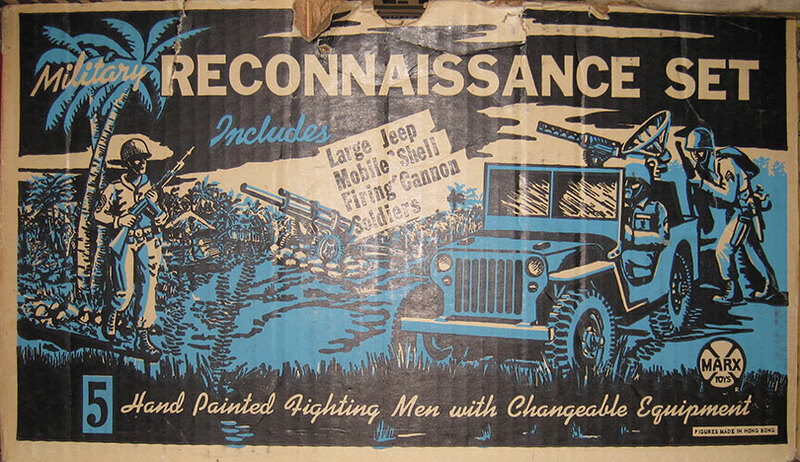 I mean, you just never see really nice complete figures all set up with their rare accessories, much less in original packaging from the 1950's -- much less again their boxes and advertising material. We found this to be a fascinating experience, and gained a lot of insight ourselves, putting this it together. Mark has an encyclopedic knowledge of the tinniest details which we have tried to bring you in equal detail and photos. 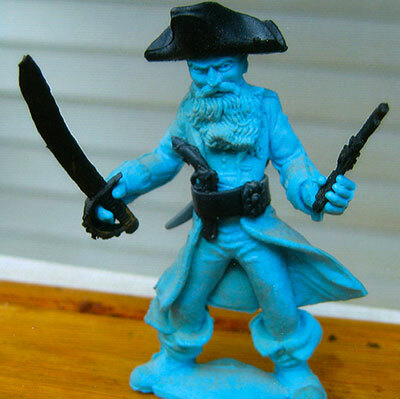 And that would have been quite enough, but through a bit of diligent searching and using the best contacts we could, the very sculptor and creator of the Pecos line of figures, Mr. John Benneth himself, has been found. In this issue he contributes his background and experiences first hand, making this the full spectrum Pecos story we always wanted. The story is told with rich insights and stories about Peco’s figures’ creation in exciting, authoritative detail. And for the first time ever, you'll know exactly what sword or gun or helmet goes with which figure. These sculptures are so powerful in facial expression and with such cleverly devised accessories, it had a lasting effect on kids. That glowering glare of Blackbeard for instance will shiver yer timbers! We add our thanks and first-time applause to John Penzer and Richard Carroll who deliver some great research to fill out the stories. We also present the Marx Fighting Marines article, with photos again by Mark Hegeman. This is the first appearance of the 6” hard plastic Goldmarx figures in our very colorful and informative article done the PM way. But we're not done yet -- We also have a unique Cavalry Post, plus Tim Young’s update on the Combat! gun set, as well as the last of the Sesquicentennial Civil War series (this one is hard to say goodbye to! ), a review or two and more. It's a great kick-off to Spring fun and collecting, and we hope to see you art some upcoming shows as we all tuck a new prize or two into those haversacks to add to our collections. Thank you so much for being here, you are making the hobby grow!